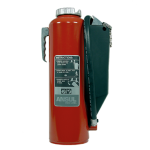 We Carry the Full Line of Ansul Portable Fire Extinguishers. Dry chemical extinguishers are designed for protection of light and ordinary hazards. These compact and portable extinguishers are suited for both industrial and commercial fire protection needs. 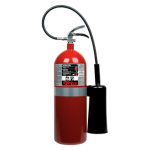 Found virtually anywhere a general-purpose fire extinguisher is needed, dry chemical extinguishers are ideal for schools, offices, auto repair facilities, warehouses and many other applications. 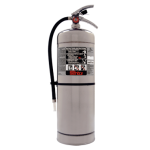 Clean Agent Extinguishers are designed for the protection of commercial and industrial facilities that typically contain sensitive or irreplaceable equipment and materials that could be damaged or destroyed by water, foam, dry chemical, or carbon dioxide. 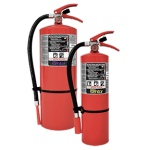 Offering superior performance, CLEANGUARD extinguishers are electrically nonconductive, environmentally friendly, and extremely low in toxicity. 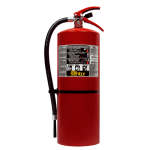 High-Flow, Stored-Pressure Fire Extinguishers are designed specifically for commercial, compliance markets. 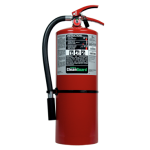 This portable fire extinguisher provides cost-effective, high performing fire suppression to meet the requirements of NFPA 10 Standard for Portable Fire Extinguishers. Every year, a variety of incidents lead to fires that cost businesses their critical assets. 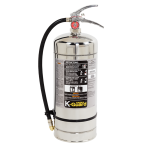 Carbon dioxide extinguishers provide the power to respond quickly and effectively by design to protect against Class B and Class C fires. 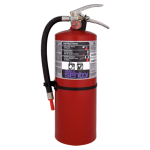 These extinguishers are well suited for indoor use in furnace rooms, printing presses, pump rooms, electrical power panels and laboratories where winds and drafts do not affect discharge. Industrial dry chemical extinguishers are designed for protection of light, ordinary, and extra high hazards. These extinguishers are built to survive in harsh, corrosive environments, such as the mining and chemical industry or in marine environments. Auto repair shops, electrical equipment rooms, machining operations, material handling vehicles, warehouses, hotels, banks, offices, and schools are other applications. Cartridge-operated fire extinguishers are the premium firefighting units preferred by safety directors worldwide in high fire-risk industries such as chemical, petro-chemical, oil and gas, mining, aviation, and power generation. Cartridge-operated means increased reliability, on-the-spot recharge, ease of service, and superior firefighting performance. 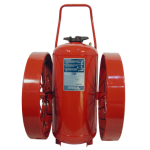 Wheeled Extinguishers are designed to protect high fire-risk areas where the potential for large fires exists. These heavy duty units have greater extinguishing agent capacities than hand portable extinguishers, yet are mobile and can be operated by one person. Many applications can benefit from the protection offered by these extinguishers. Available in both Dry Chemical and Carbon Dioxide.